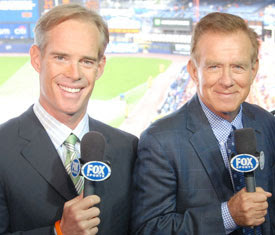 Today, Joe Buck and Tim McCarver were doing the commentary for the nationally televised game of the week between the Chicago Cubs and St. Louis Cardinals. In the top of the 7th inning, the Cubs have men on first and second with only one out. A grounder is hit to the third baseman who knocks the ball down a step from 3rd base. Derrek Lee, the runner at 3rd, touches the base just before the fielder recovers and throws on to first for the out. McCarver says that Lee should have tried to score on the play, because at worst, Chicago would have men on first and third with two out. Hey Tim, they still have men on second and third with two outs. Isn't second base, unlike first base, scoring position? It didn't matter since Lee eventually scored on a bases loaded walk and the Cubs went on to win the game handily 9-3, but McCarver's take on the play was way off. Lee had no chance to score on the play. He didn't have a big lead off third to begin with. I'm certainly not on D-Lee's payroll, but it was stupid for TM to dog him on that particular play. I thought he should have said Lee did a good job of getting back to the bag before a tag could be made. You did play this game yourself at one time didn't you Timmy? You appear to be in need of a cold shower to loosen up those cobwebs...perhaps another like this one!